Learn about proper UV lighting and slider turtle basking lamp options. For indoor setups, most turtle keepers provide UVA and UVB through special fluorescent bulbs. These bulbs are specially manufactured to emit UVB rays and have special glass casings that allow the rays to pass through. They come in different sizes and strengths but produce very little heat since they are low-wattage. It is beneficial to have a bulb that produces approximately 5-10% UVB. These bulbs are generally effective for about 6-10 months and will need replacement afterwards. Fluorescent UVB bulbs do not project UVB very far, so it is necessary to have it positioned closely – 10 inches above the basking area would suffice. 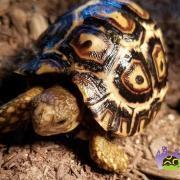 Before purchasing your new slider turtle for sale, doing your proper slider turtle care sheet studying can help you provide the best life for your new red eared slider turtle for sale. When searching the various types of red eared sliders for sale, consider the different slider turtle color morphs available including the albino red eared slider (albino res for sale) as well as the lemon lime albino red eared slider turtle (lemon lime albino res for sale) and the caramel pink red eared slider turtles. Red eared slider turtles eat a variety of items in the wild and while we can’t exactly mimic these foods exactly for our baby slider turtles, but there are ways that we can provide them with some great nutritious options. Prey items: Earthworms, crickets, waxworms, silkworms, aquatic snails, bloodworms, daphnia, shrimp, krill, and meal worms. For very small red eared slider turtles, prey may have to be cut into smaller pieces. Larger and adult turtles can be offered larger items like tadpoles or feeder fish, though some experts warn that feeder fish may be carrying parasites, etc. and some fish (like goldfish) are too fatty to be fed regularly. Leafy greens: Collard greens, mustard greens, dandelion greens, kale, and bok choy. Head (iceberg) lettuce should never be fed as it contains very little nutrition but dark green leaf lettuces (e.g. romaine) can be fed sparingly. Make sure you only feed items with appropriate calcium to phosphorous levels. Aquatic plants: In both an aquarium or pond you can add aquatic plants on which turtles usually love to snack. Submerged plants like anacharis are often eaten by turtles, as are water hyacinth, water lettuce, duckweed, azolla (fairy moss), and frog-bit. Other vegetables: Carrots (tops are fine too), squash, and green beans. Some people choose to feed adult turtles once only every three days while others prefer to stick to smaller meals and continue feeding them daily. No matter which feeding schedule you choose, the important thing is not to over feed your turtle, especially with items high in protein and fat since red eared sliders and other aquatic turtles often have voracious appetites and will beg for food. Some owners describe their pet turtles doing a frantic swim as if trying to fly straight out of the water or staring at them like a dog begs for food. However often you feed your turtle, be sure to monitor their body condition. If folds of skin are developing around their legs, especially when your turtle pulls their legs into their shell, they are getting too fat and need to be fed smaller amounts, eat less often, or offer food with a lower fat content. Remember that adult red eared sliders are quite herbivorous so if your turtle seems overly hungry, try feeding more leafy greens and plant material rather than aquatic turtle pellets or prey food items.